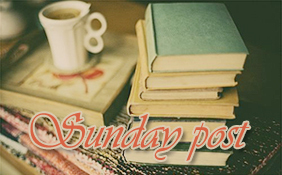 Sunday is when I sit back with a lovely cup of tea and write about all the wonderful new books I've received and purchased in the past week. This post participates in fab memes Showcase Sunday and Stacking the Shelves. There is such a festive theme running through my books this week, I love it! I've been waiting on Christmas at Rosie Hopkins' Sweetshop for a while now and unfortunately I have a few review books on the go at the moment that I have to finish first, but I'm very excited to start reading it. I'm also really looking forward to Fractured which sounds like a poignant read and has received fantastic reviews in the blogosphere so far. And while I've completely run out of shelf space and promised myself that I wouldn't buy any more books for a while... when I walked past a charity shop yesterday, Welcome to My World caught my eye in the window and it was screaming "BUY ME!" 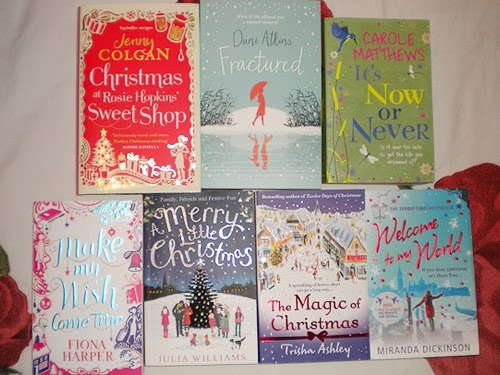 Of course I has to oblige and when I had a look inside the shop I found a few more books from authors I love, plus one I'm unfamiliar with (Julia Williams) but has a super cute seasonal cover so I had to pick those up to. Since I got my Kindle last week I've also gone a bit crazy with buying heaps of free and 99p ebooks from Amazon, though there are too many to mention them all above. I am nicely stocking up for my Christmas break though. Haven't heard of these titles yet, but great books! OMG I LOVED FRACTURED! Seriously the best book I have read this year! Really hope you enjoy! I also have Make My Wish Come True to read. I read The Magic of Christmas last year and thought it was a great read. Have you read The Twelve Days of Christmas by Trisha Ashley? It's definitely her best book! Ah the danger of the one-click on kindle! Can definitely relate there! Hope you enjoy them all though and excited to hear what you think of Fractured. Freaked out the INSTANT I saw Fractured - read it as soon as you can it is AMAZING and mindblowing and I hope you love it so much! I love how festive your haul looks! :) Glad you got a copy of Christmas at Rosie Hopkins' Sweetshop - hope it lives up to your expectations! There's lot of winter/Christmas themed stuff going on there! Hope you enjoy! Wowee this is such a Christmas-y haul! The Sweet Shop cover is adorable! Makes me excited now for Christmas! Great haul. Enjoy! Your haul looks very festive. Between that and seeing the John Lewis advert, I feel like Christmas is just around the corner! Here's how my week went. Oh my god, your Christmas haul is AMAZING! I'm so totally jealous and I hope it gets you right in the Christmas mood! Don't they make a pretty picture all together! I shall be starting my first Christmas themed book along with my advent calendar on Sunday!